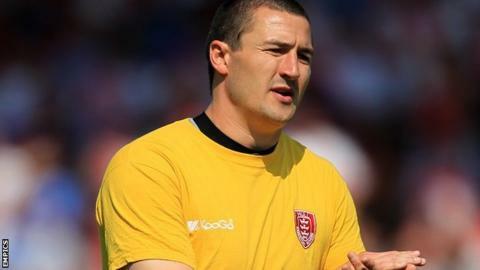 Hull KR have made Chris Chester their head coach on a permanent basis. The 35-year-old, who has been in charge of the team for two months on a temporary basis following the departure of Craig Sandercock on 3 July, has signed a three-year contract. Rovers have won twice in six matches under former player Chester. "I'm absolutely delighted," said Chester. "It's a dream come true for me and I'm going to do my utmost to get this side back to where it belongs. He added: "It's been a testing period with some ups and downs but I've really enjoyed the opportunity. I've not been afraid to make the big decisions, I've been honest with the players and they've been honest with me in return, so hopefully that will continue." Hull KR chief executive Mike Smith said: "It's always been the plan to bring somebody through the ranks to one day take over as head coach and Chris has started very well in the role. "He is somebody who understands the club and the squad of players he will be working with, but more importantly he is a young British coach who is ready for this position and responsibility. "He's learnt his trade and he's very well respected within the game. The board had no hesitation in backing him with a three-year deal and I'm sure the fans will now join us in giving him their full support for the rest of this season and beyond." Hull KR lie ninth in Super League, two points behind Widnes in the race for the final play-off place with three games remaining. They face local rivals Hull FC at the KC Stadium on Friday. Read more on Kieran Dixon: Is the future of rugby league a 5ft 7in Londoner?